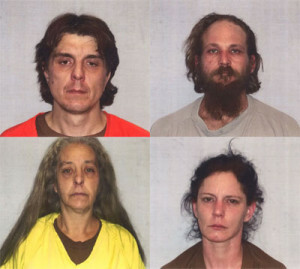 Richard Carson, Christopher Elbon (top), Lynn Sutton, Tracy Johnson (bottom L-R). Two people who went missing over the weekend in south-central Iowa’s Clarke County were later found dead from apparent gunshot wounds and now four people have been arrested in the case. Osceola Police Chief Marty Duffus says law officers were informed Saturday night that the two victims had disappeared Friday evening. “After further investigation, the two missing persons were located in a vehicle in rural northern Clarke County,” Duffus told reporters gathered outside the Clarke County Law Enforcement Center. “They were deceased and it appears they both died of gunshot wounds.” Autopsies are scheduled for Tuesday. The victim’s names have not been released, but Duffus said they’re both men in their 20s. After the bodies were found, the Iowa Department of Criminal Investigation was called. 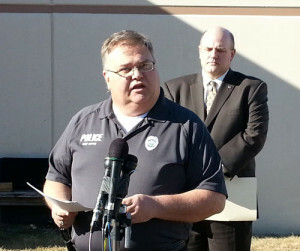 Iowa DCI Special Agent in Charge Michael Motsinger said four people were arrested early this morning in connection with the double homicide. “They were taken into custody without any problems. They didn’t resist, so we didn’t find the weapon on them at that time,” Motsinger said. The gun allegedly used in the killings was recovered later, according to Motsinger. Osceola Police Chief Marty Duffus. The person accused of shooting the two individuals is 38-year-old Richard Ryan Lamb Carson of Osceola. He’s charged with two counts of first-degree murder. Three other Osceola residents are each charged with one count of accessory after the fact. They’re identified as 47-year-old Lynn Ranean Sutton, 43-year-old Tracy Kay Johnson, and 42-year-old Christopher Martin Elben. Carson and Johnson are described as being boyfriend and girlfriend. At this morning’s press conference, Motsinger did not reveal a possible motive in the case. “Just following up on leads and talking with people led us to these four individuals that we’ve charged with this crime,” Motsinger said. Authorities said the case appears to be an isolated incident and the public is not in danger.